To say that in real life, Le Tour de France is something of a spectacle, would be a very large understatement. Over 150 cyclists barrel around 3,500km of some of the world’s most incredibly picturesque countryside routes in a huge pack for the best part of a month, each straddling bicycles that can cost upwards of $10k apiece. Then at the end of it all, Chris Froome usually wins. It’s a test of endurance that would leave most normal humans crying at the side of the road; their thighs chafed into a red raw mess within about 10 minutes of the starting gun going off. Cyanide has been developing games based on this unique event since 2011, with each annual release usually providing minor changes to the previous one to give the impression that it’s worth buying again. This year’s edition – Le Tour De France 2018 – is no different. Things are very much as they were in the previous game, with small alterations and improvements here and there and a new mode that barely qualifies for that description. Everything you’ve seen before is still here. 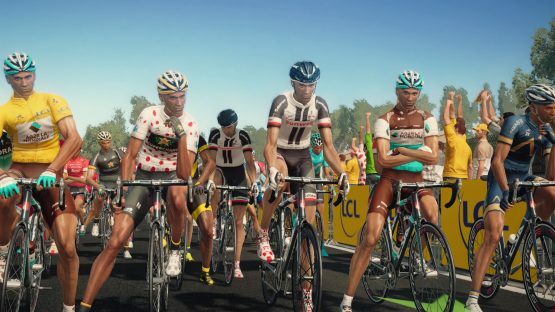 A bare bones challenge mode allows you to take on one-stage rides and test your skills against online leaderboards, whilst all the tools are in place to let you build a multi-year dynasty that takes on a few (but far from all) of Europe’s major cycling events either on your own, against a friend, or in co-op. The showcase inclusion this time around though, is the new “Pro Leader” mode. Here, you create a very, very average cyclist from scratch and are tasked with leading a team of much better riders across the course of multiple seasons, improving your leader’s ratings and skills as you participate in events. You can bump your numbers by checking things off a lengthy list of goals. Amongst many others, being first in an intermediate sprint during a race will improve your sprinting, while pushing the pace for 100km will improve your stamina. Some of these tasks are a little nonsensical to be taken seriously, as they’re all or nothing affairs. For example, completing the impressive task of scaling a 10k double-digit gradient climb and crossing the summit ahead of 174 other riders but two-hundredths of a second behind the leader of the race – who may be the best mountain cyclist in the world – isn’t enough to see your numbers improve. It’s win or bust. It sounds like it should all work, but as with many things in Le Tour De France 2018, that isn’t the case. In every mode other than the single challenges, you must oversee the entirety of your eight-man team for the duration of the race. So, while you have direct control of one rider, you’re also popping into the “Team Comm” menu to tell the other guys to attack, relay faster, stay in the peloton, protect each other, slow down, or even consume one of their limited nutrition packs. If they listened to you and behaved as if they had an ounce of sense in their heads, this would probably be fine, albeit still a little overwhelming. Unfortunately, though, it’s often as if the rest of your team members just do whatever they want, very rarely in a way that would be beneficial to your chances. Say you think your best shot at victory is to break away from the peloton in the early going and try to hold them off for the rest of the race. You want your whole team to advance and form a group that can relay with each other, helping to conserve each rider’s energy after that initial push to the head of the pack. You maneuver the rider you’re directly controlling toward the front, head into Team Comm (which handily pauses the game) and select your other seven riders. The option to tell them to catch up to your rider may or may not be there, depending on seemingly random events. So, the only options you have are to tell them to increase their pace (which usually causes all 170-odd riders in the whole peloton to speed up alongside them) or to stage an attack. Do this, and they’ll attack until they’re out of energy, then slow down to refill their stores until they’ve fallen all the way back to the main group, making the whole thing utterly pointless. You can turn off the AI’s ability to make decisions for you via the options menu, but that makes things even worse. If you have to manage the tactical approach, effort, and energy levels of eight riders at once, the game has to find some happy balance between giving you full control and giving you a helping hand. Le Tour de France 2018 doesn’t come close to it. The game’s fast-forward ability means you don’t have to play every second of every stage. You can decide to sim things up until a kilometer from the summit of the next climb, for example, jumping back into control if you see something going wrong. Being able to play them quickly means that stages have something of addictive quality to them, as they no longer take a thousand years to complete. The downside is that the AI takes full control of tactics as you’re fast forwarding, often completely overriding what you’ve already asked your guys to do. If you do manage to get your crew together in a breakaway that’s two minutes ahead of the peloton, you’ll often find that speeding things up for the next ten kilometers will see your guys fall all the way back. So now they’ve expended a bunch of energy to get out in front, dropped back into the pack, and won’t have enough left in the tank to trouble the podium when the final sprint comes. Either that, or you’ll fast forward and see half of your team repeatedly try to burn themselves out until they’ve hit their limit, stop pedaling, and fall 25 minutes behind the leaders. At the very least, it should tell you which tactics it’s changing for you and when. Instead, it alters things silently, leaving you to try to work out why your team is suddenly losing ten seconds a minute on the field. There aren’t even any options to set a strategy before the race begins, which would alleviate a lot of the issues. 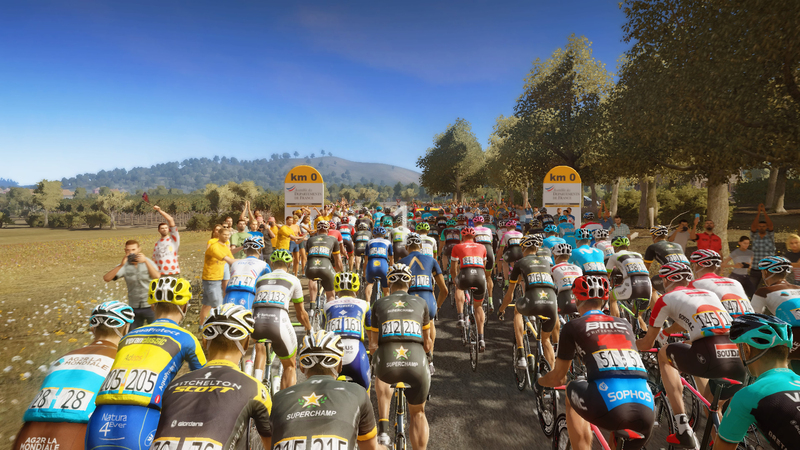 Being a pro rider with an AI manager giving you instructions, negotiating contracts to move to better teams with better assist riders, and improving your skills to move your way up the ranks until you take the yellow jersey would have fit the bill nicely. Instead, the big inclusion this year is essentially a copy of the existing main game mode; only you’re forced to have a created character on your team. This oversight is a real kick in the cycle shorts, since the actual riding action – as slow as it can be – looks good, is easy enough to get to grips with and is otherwise well realized. Excluding any part when anybody speaks, that is. A special note must be made here about the voice acting since it’s atrocious. Your teammates all have the same upper class English voice, even though four of them are Croatian and the closest the other three have been to Britain is when they accidentally stumbled on an episode of Sherlock on Netflix in the team hotel. On top of this, the commentator forgets how to pronounce the word “point” from time to time, depending on the sentence, and your Welsh sports director seemingly exists solely to criticize. Apart from the times he shouts “PUNCTURE! PUNCTURE! Only kidding!” out of nowhere of course, which, as you can imagine, is just side-splittingly hilarious. Every. Single. Time. Having that sports director telling you at least three times during every stage that you need to shelter from the wind is plain annoying, especially when the game hammers this basic and obvious point home time and time again but then expects you to already be an expert on everything else to do with competitive cycling. You’ll be expected to know what barouders, roulers, and puncheurs are, as well as what the perfect tactics are for shorter sprint races that contain a few sharp climbs. Having absolutely no hints other than “this event will be a sprint at the end” as to the best way to approach each stage means that Le Tour De France 2018 will be utterly impenetrable to anybody who isn’t a student of competitive cycling tactics. You can work it out just by plugging away and losing race after race, but the majority will have given up long before they’ve attained any success. Combine all this with a fair few presentational and functional bugs – my first win came when my time wasn’t recorded but I was deemed to have completed the course, so I won a three-stage event by three hours – and it’s hard to avoid concluding that Cyanide is resting on their handlebars, somewhat. When you’re doing the same and cruising downhill through the beautiful countryside or fighting and clawing to get your wheels in front at the top of a grueling climb, Le Tour De France 2018 is enjoyable stuff. But outside of those times, it’s yet another buggy and undercooked update for a title that had fallen off the pace a few iterations ago. Le Tour De France 2018 review code provided by the publisher. Version 1.03 reviewed on a PlayStation 4 Pro. For more information on scoring, please read our Review Policy.